Milford is a often a laggard, but we're in the part of the cycle where the laggards play catch up. Whoosh, there goes Milford. 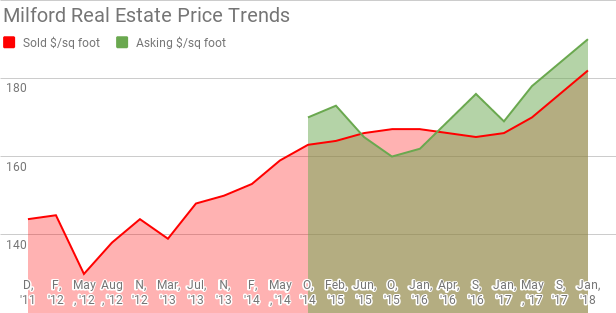 Prices are up sharply, and there's nothing for sale, showing the trend has legs. Very hard to shoot any holes in the data. Yes, seasonally it's a low time for property. But everything is green in Milford. What should potential home buyers do in Milford ? It will be hard to comparison shop. Do your homework, and know the levels that your homes sell at. It's easy to overpay in a market this tight. Sign me up for Automated E-mail Alerts of New Listings in Milford! Is this an OLD report? Get Updated Info. What should future home sellers do in Milford ? Home sellers should get their home ready. Things are great, but we are in the later stages - at some point, inventory will return. Prices won't go straight up forever. There are 21 homes actively listed as For Sale for Home Buyers. In Milford there have been 198 houses sold in the last 6 months, and 112 homes sold in the last 3 months. 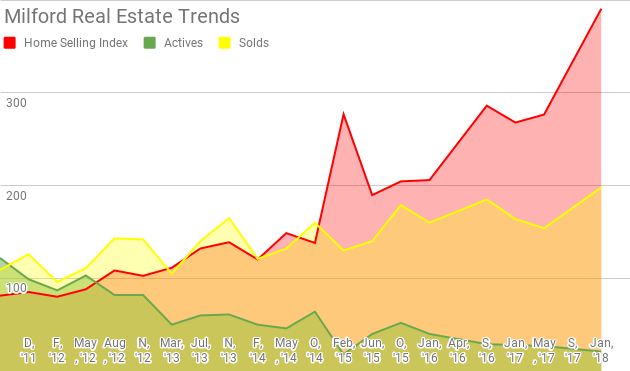 The Average number of Days on Market was 27 days for recently SOLD homes In Milford. Homes for sale have been sitting for an average of 106 days homes For Sale (currently for sale). Milford , MA, has 1 properties advertised as lender owned or foreclosure (typically foreclosure) . There are 1 properties advertised as a short-sale is going to be needed by the lender.